After the three hour hike around Bur Dubai and Deira Ginny and Sern took us to Ibn Battuta Mall for lunch. This mall is fast becoming a firm favourite with its diversity of themes and array of shops, boutiques and eateries. As we entered the premises a young Emirati man walked by with a scent that was distinctively Middle Eastern which captivated my senses. However, since we were strangers it would hardly seem appropriate for me to walk up to the man and ask him what scent he was using, right? Oh well, rather than be perceived as a pervert I decided against approaching him. The captivating scent of spices and cinnamon, however, continued to haunt me the entire day. We walked along the China Court until Ginny and Sern found what they were looking for, in terms of replenishment and sustenance. 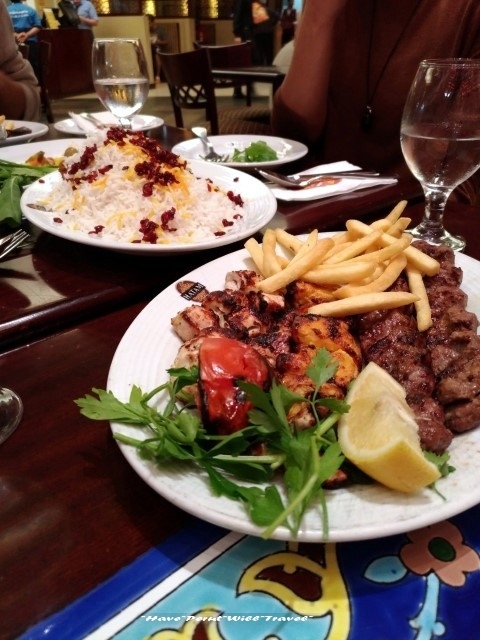 Located at the China Court Hatam is a restaurant that promises an Iranian and Persian casual dining experience. Brendan was so hungry his hair turned grey! 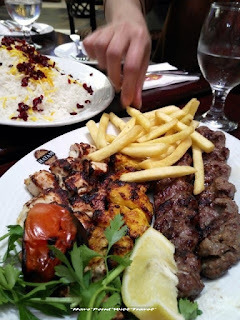 Ginny and Vincent ordered two mounds of fragrant Persian rice served alongside fire-grilled kebabs of beef, lamb and chicken to be shared among the four of us, while Brendan had lamb chops all to himself. Partly due to the fact that we were famished but mainly due to the fact that Hatam served some of the best kebabs we’ve had, we made short work of the dishes that lay before us. Brendan followed suit and polished off his plate of lamb chops in no time. Lunch out the way, we walked around looking for ‘dessert’ and ended up at our new favourite café. Yup, we found ourselves at Caribou Coffee over at the Persian Court and had us a round of finely brewed lattes and mochas. Interestingly enough, I took a photo of my new pair of walking apparel which was accepted by a website that I contribute photos to as being on its list of ‘premium’ photographs. Imagine that! Suitably rested and appropriately recuperated after our morning hike, we made our back to Nuran for it was Christmas Eve!